The tale of Nørrebrogade keeps getting better. This is the street that the former traffic Mayor, Klaus Bondam, tackled in order to cut the number of cars and increase the liveability for the residents. We're written about the street many times. There is a long list of intiatives that have been tried and tested on the street, which is also the busiest bicycle street in the world. 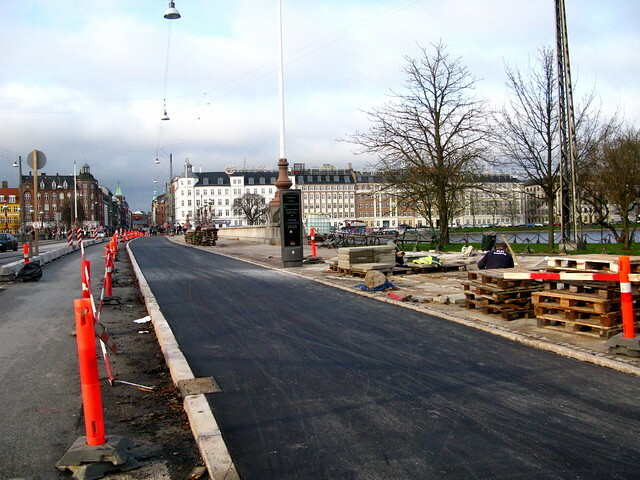 The City of Copenhagen recently published a study about the first stage of the redesign of the street: Københavns Kommunes Evaluering af Nørrebrogadeprojektets Etape 1. Please don't try to pronounce that without qualified linguistic supervision. Car traffic has fallen by 60% from 15,000 to 6,000 a day. This is a neighbourhood where 19% of the residents own a car, so the traffic was/is largely "parasites". The street had long suffered from lack of development and was a sad, lifeless transport corridor through what is a fantastic, densely-populated neighbourhood. These cycle tracks are now completed. Loads of space for conversation cycling and overtaking. Between 2008 and 2012, the number of bicycle users increased by 20%, due to a variety of factors. The Green Wave for cyclists, which was first launched on this street, has improved the traffic flow for bicycle users and is considered the primary cause of the increase. Generally, the traffic calming effect of the project has encouraged more people to use the street. In addition, the widened cycle tracks at the southern end of the street, where the bicycle traffic bottlenecks, are a massive help dealing with bicycle congestion. The highest number of bicycle users to cross Queen Louise's Bridge in one day is 40,000. There are bridges with high numbers of bicycle users, and one of them - Knippels Bridge - is giving Queen Louise's Bridge a run for its money, but these 40,000 bicycles are a fantastic number. This is really a noticeable change. You can really see the increase if you frequently cross the bridge. The traffic calming of the street clearly encourages more people to walk. Faster buses? A good thing. The nay-sayers guessed that shutting off the street to through traffic would only send the motorists out onto many other streets in the neighbourhood. They were wrong. There has been a fall of 10% in the entire neighbourhood. Also, on the large arteries surrounding the neighbourhood there hasn't been a compensated rise in the number of vehicles. 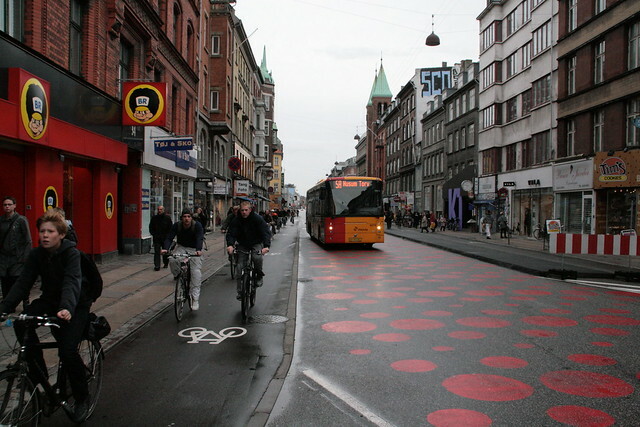 Noise pollution from car traffic is a major problem in Copenhagen - like in most cities. The noise levels have been reduced on this street. The only effective way of lowering noise pollution is removing cars or speed limits. The number of small businesses has only fallen by four. Rumours of imminent death for small businesses were grossly exaggerated - as they always are. Bicycle users, bus passengers and pedestrians are the backbone of retail sale. There are only four fewer small businesses on the street. Which is roughly the same as most other neighbourhoods in Copenhagen. Nørrebrogade is a success. We were never in doubt. 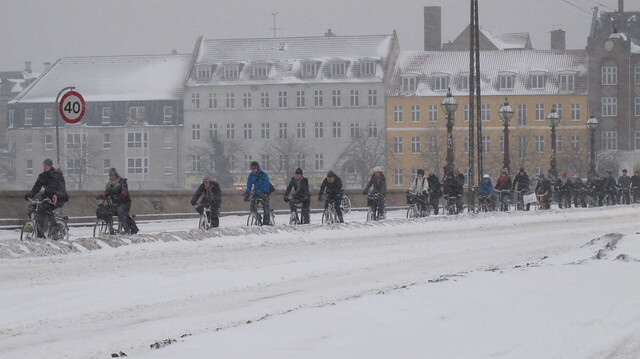 Now it's time to roll out the concept over all of Copenhagen.